The Talking Box: Pan Am: Farewell 1963! Well, nothing is official yet, but this is still technically a "season" finale, rather than a "series" finale. But, it sure functioned as either one! Ending on a New Year's Eve episode is a nice wrap-up, and having the main cast sharing that midnight moment provides a lot of closure. Kate has the option to leave PanAm, Dean is off for six months, Colette is taking a leave to search for her long-lost brother, and Maggie just came into enough money where she might not have to work for a while. However, there were still things left unraveled... Ted had called off his wedding to Amanda, but she's pregnant and he didn't even tell Laura before kissing her again, Colette just found out that she is Jewish AND has a brother, and we're not sure if Kate and Niko really ended things. Do I want the show to be renewed? Honestly, I could take it or leave it. I enjoyed the first four or five episodes quite a bit, but things got rocky and ridiculous in some ways. I think that they might have just been adding elements for "spice" toward the end, but that's a bit presumptuous. If it gets canceled, I won't be heartbroken, but if it gets renewed, I'll continue to cover it. If any of our readers stayed with this show through its entire first season, what do you want to happen to it? Dean is called into a hearing regarding his actions in Haiti. Both his choice to land there and his bringing back of a refugee are scrutinized, plus a passenger filed a complaint against him. [well this doesn't look good...] Mr. Tripp, however, has written a letter that influences the board enough so that Dean can keep his job, though his flying privileges have been suspended for six months. 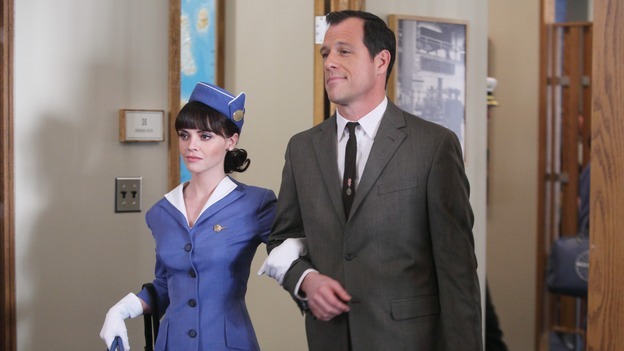 This episode was probably one of the best Pan Am episodes ever. The series, which has had ups and downs throughout its run, is basically good, just needs better writing. Too bad it was canceled, but hopefully, the rumors about Amazon pickIng up Pan Am are true. Maybe, instead of streaming on Amazon or something, it can become a book series. This is an unusual idea. But there are many bright sides to this. It is much cheaper than producing on tv, no bad acting, and, most importantly, no chance of cancellation.